You Can’t Do That To Ramen Noodles! CampusSqueeze.com has a “recipe” for grilling ramen noodles like a steak. I can add nothing else. The engine is code-named the DIG-T R and in addition to its 400-horsepower peak power rating it also develops a maximum 280 pound-feet of torque–numbers that make it almost comparable with some V-8 engines still on the market. At a ratio of 4.5 horsepower per pound, the new engine even has a better power-to-weight ratio than the new turbocharged 1.6-liter V-6 engines to be used in Formula One this season. 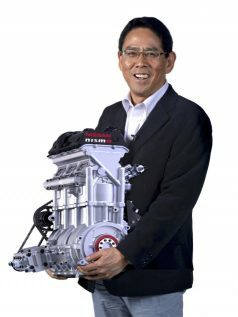 The engine is a turbocharged 1.5-liter three-cylinder putting out an incredible 400 horsepower, but what’s more impressive is that the engine weighs just 88 pounds, which means a human is quite capable of carrying it (turbocharger and all), as NISMO chief Shoichi Miyatani demonstrates above. I just came across Unsplash.com, an interesting photo blog; lots of great high res photos – just keep scrolling down. MyTikker.com is accepting pre-orders for Tikker – The Death Watch ($59.00). The watch counts down the time until you are expected to exit this mortal coil. I find it rather depressing, but I would probably feel more optimistic about this gadget if I were 20 years younger. If you are not creeped out and want your own Death Watch, get it HERE.